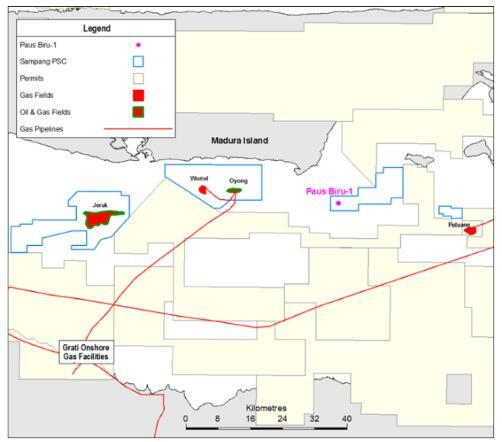 JV partner Cue Energy Resources, through its 100% owned subsidiary Cue Sampang, has announced a gas discovery at the Paus Biru-1 exploration well offshore East Java in the Madura Strait, Indonesia. Paus Biru-1 is located in the Sampang PSC approx. 27 kms east of the producing Oyong Gas Field. The well was drilled as an exploration well to a total measured depth of 710 metres and intersected estimated net gas pay of 29 metres across the primary Mundu Limestone Globigerina reservoir target. The Participants in the Sampang PSC are: Santos (Sampang) (An Ophir Energy Group company) 45% (Operator); Singapore Petroleum Sampang 40%; Cue Sampang 15%.